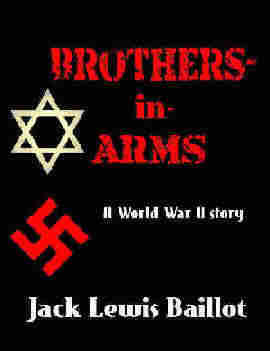 Franz Kappel and Japhet Buchanan never expected their friendship to be tested by the Third Reich. Friends from early childhood, the boys form an inseparable, brotherly bond. Growing up in a little German village, they escape most of the struggles of war until the day Japhet is banished from school for being a Jew, and later has a rib broken when other village boys beat him up. Franz learns he is putting himself in danger for spending so much time with Japhet but continues to stand up for his Jewish friend even at the risk to himself. Then one day their lives are shattered when they see first-hand that the price of being a Jew is dangerously high. With the war now on their doorsteps, Franz and Japhet come up with a desperate plan to save their families and get them out of Germany alive. Leaving behind the lives they've always known, they move into Berlin with nothing to protect them but forged papers and each other. Convinced their friendship can keep them going, the boys try and make a new life for themselves while trying to keep their true identities and Japhet's heritage a secret. Taking his best friend's safety upon himself, Franz joins the Nazis in an attempt to get valuable information. At the same time, Japhet joins the Jewish Resistance, neither friend telling the other of their new occupations. With everyone in their world telling them a Nazi and a Jew can't be friends, it is only a matter of time before they believe all the lies themselves, until neither is certain if they are fighting against a race of people or fighting for their homeland. Somehow they have to survive the horrors of World War 2, even when all of Germany seems to be against them. Japhet turned in a slow circle, and his heart dropped into his boots when he saw them, stepping out of the trees. They moved like ghosts, without a sound even as they lifted their rifles to their shoulders. Japhet forgot how to breathe, how to move, but Franz thankfully turned about the same time and didn’t freeze at the sight of the Nazis taking aim at their backs. I go by the name Jack. I've been writing since the age of thirteen when I decided all I would ever write would be books about the Oregon Trail and Pioneer Life.